The Cloud – A Better Network, Inc.
You’ve most likely heard of the Cloud, but do you understand what it is and whether it would be a good fit for your company? We can help you get past the hype and find the areas where it would be advantageous for your business moving forward. Understanding what the Cloud is can be a bit overwhelming. There has been a large push by vendors to get businesses to move to the Cloud. They see real value in moving you to a subscription based model and it isn’t necessarily a bad thing for the business either. Lower initial cost of investment for implementing new technologies, upgrading existing services and remote access to your data and applications are quite compelling. As with any other business expenditure you should evaluate the upfront savings vs. the long term return on investment. Simply put you are taking data that you have on your computers and/or devices, moving it to a server at a remote location that you can access anytime you have internet. The concept isn’t really new. For years we have all been using the Cloud for hosting our websites and email. For example if you have been using Gmail, Yahoo mail or any other web-based email service you are accessing it in the Cloud. No matter whether you were in the office, at home or travelling you could get to your email in a browser. With the availability of high speed internet and new server technologies that allow you to run applications on a remote server, some applications that previously needed to be installed locally can now be accessed across the internet. This means that companies with multiple locations and/or employees that need to work remotely can get access to the same data in real time. In the image above you can see that data that is in the cloud is shared with each branch and the mobile devices. 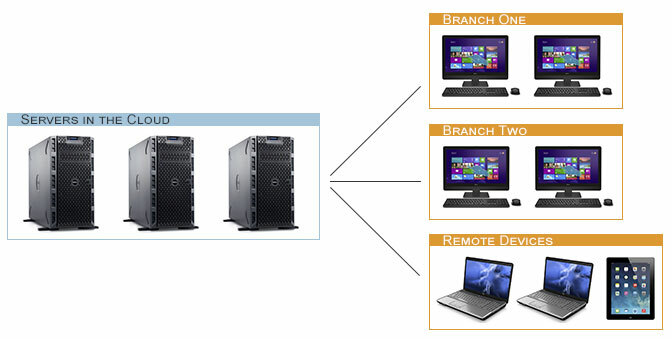 What is not shared is data directly between each branch and the remote devices. Example Scenario: John is in Branch One and creates a document that he needs to share with Sarah who is in Branch Two. Both users need to have the most recent version of the document and will both be making changes to it. Previous Solution: In the past John would email the document to Sarah. She would make her changes and email it back to John. With different versions of the document on the server in Branch One, Sarah’s pc and both of their email programs this can cause all sorts of issues for both employees as well as anyone else that might need to use the document. Cloud Solution: By storing the document in the Cloud John and Sarah can both work on the document without having to worry about if they are looking at the current revision. With collaboration features in some programs they can both work on the document at the same time. File history enables John and Sarah to go back to a previous version if necessary. Businesses have had options in the past for accessing data remotely via VPNs, Remote Web Workplace, and other services like GoToMyPC for example. These options might of been priced out of your budget or beyond the scope of what your IT staff could implement at your office locations. There have been improvements in these services as well which we will go over later in the hybrid-cloud section. There are several key factors that should be addressed before signing a contract with a cloud services provider. ABN can help you evaluate your business environment and make an informed decision on whether moving some or all of your systems to the Cloud is going to bring value to your company. What network applications are you running? Some legacy applications will not work in a Cloud environment. For example some Line of Business software integration with QuickBooks will not work if QuickBooks is operating in the Cloud. How large are the files that you are accessing across your network? Data access speeds can be seriously affected by moving from a gigabit network to being reliant on your internet connection speed. If you work with large files you might want to consider a hybrid-cloud environment utilizing a local file server or network attached storage for your large data. How much bandwidth can your internet connection handle? Since you are going to be accessing the data across the internet do you have enough bandwidth to handle the additional downloads and uploads to the Cloud servers. Is your internet connection stable? If you frequently have disconnects or loss of data on your internet connection it is going to cause issues with accessing your data in the Cloud. If you have issues with your internet connection what options are available? The availability of options from your ISP for increasing your internet connection speeds and options from other ISPs able to service your locations should be verified for availability and price prior to moving to the Cloud. Which Cloud provider should we use and who is going to give us the best service and performance for our business needs? This really depends on location and needs. Some Cloud based services are locked into utilizing specific companies. There are some great advantages to moving some or all of your services to the Cloud. Lower initial cost of investment – Since you are not purchasing the hardware, just leasing space at a colo, your initial cost of investment can be lower than if you purchase a server and put in place at your location. Flexibility – When you need more storage or bandwidth from the server your cloud hosting company should be readily able to provide those services to you with minimal or no down time. Managed services – Some services that you’d normally have your IT personnel manage are taken care of by the cloud services provider such as updates and backups. Collaboration – Since your data is accessed from the internet it can be easier to share with employees at other locations, on the road or at home. Additional Services – You can add additional functionality that might be too expensive to implement and maintain locally by going to a subscription based online service such as Office 365. Exchange Online, OneDrive for Business, Skype for Business and SharePoint are all great options for increasing productivity at a very cost effective price if done through an Office 365 subscription for even the smallest companies. Depending on what data or services you want to move to the cloud there can be some negative impacts and they should be evaluated before making the jump and getting locked into contracts. ABN can help you evaluate short term vs long term costs and what impact the move will have on your day to day business. We’ll work with you to make an informed decision to get real business benefits out of your investment. By utilizing local servers for mission critical data and legacy applications and cloud services like Office 365 for internet friendly services you end up with what is called a Hybrid-Cloud environment. This can give you the best of both worlds. You can save money and reduce wasted time by migrating non-critical services to a third party hosted environment while maintaining a secure fast environment for data and applications that need it. ABN can help you implement Cloud and Hybrid-Cloud solutions to improve performance, lower costs and increase productivity. Contact us here for more information or call 206-923-2100 to talk with a representative today.